2017 was a record-breaking year for the newly formed Marple Poppy Appeal Team and an amazing sum of over £15,000 was raised for the Royal British Legion's Poppy Appeal. 2018 is an extra special year for the Poppy Appeal across the country as it is the Centenary of the End of WWI. The Marple Team are working even harder to build on last year's success. 198 local men from Marple, Marple Bridge, Mellor, Compstall and High Lane lost their lives serving their country during WWI and so this year, the 100th anniversary of its end, the Marple Poppy Appeal Team are putting up 198 Street Poppies on lampposts throughout the area in their memory. All Street Poppies will carry individual names, which we believe may be unique to Marple. The Friends of Marple Memorial Park have erected 20 poppies commemorating men with links to the park - mainly the Carver family and men who worked at Hollins Mill before going to war. Other volunteers, including Marple Firefighters, have been out erecting poppies in the main streets of the area. Throughout the district, poppies commemorating the men will appear on lampposts close to the area where they lived or worked. This follows on from the success of last year's campaign, when 46 Street Poppies were erected on local lampposts to commemorate the men killed in 1917. This inspired Stockport Council to promote the idea across the borough for 2018 and this year Marple Area Committee are kindly supporting our efforts to commemorate the loss of men throughout the District of Marple. As last year, we are looking for local businesses and individuals to sponsor these Street Poppy tributes. All sponsors will be mentioned in local media. Please contact us if you would like take part. Abstract Roofing, ACM Financial Services, Asda, Beer Traders, Bishop and Co, Brabyns Preparatory School, Compstall Community Council, Compstall Cricket Club, Devonshire Arms, Edward Mellor Estate Agents, Etherow Sailing Club, Foragin, GHS Barbers, Greenhalghs Bakers, Hare and Hounds Marple, Hare and Hounds Millbrow, Helen Winterson, High Lane Garage, Hollins Building Supplies, Inkbox, KME Design, Little Treasures, Littlewoods Butchers, Marple Area Committee, Marple Bridge Association, Marple Business Forum, Marple Conservative Club, Marple Health, Marple Social and Forces Club, Marple Tavern, Marple Website, MPS Construction, No 48, One Bell Business Mobiles, Refresh Marple, Ring o' Bells, Seven Creative Movies, Sherlocks Hairdressers, Stationery Supplies, The Andrew Arms, The Bulls Head, The Carver Theatre, The Crown, The Marple Review, The Norfolk, The Northumberland, The Oddfellows, The Railway pub, The Regent Cinema, The Royal Oak, The Royal Scot, The Samuel Oldknow, The Spring Gardens, The Windsor Castle, The Works, Wyevale Garden Centre. Thank you to all these community minded local businesses and organisations! In addition we are starting a new campaign called “Who was I?” to encourage local people to find out a little bit about these men. There will be “Who was I?” cards available in various locations each with the name of one of the above men. Inside there are a few simple questions for you to research. The answers to these may be found on the Friends of the Park's inspirational “Time Line” in Marple Memorial Park, from the book "Remembered" available in the Heritage Section of Marple Library, or on the web site More Than a Name, which gives details about WWI soldiers lost across Stockport. The aim is to help people understand that these men are not just names on a monument in the park. They are a vital link to the history of the Marple area and the “Who was I?” campaign will hopefully provide a simple opportunity to connect with the past and maybe learn something special about the men and their association with the Marple area. We hope this will be a thought-provoking activity and a great educational opportunity for local schools, to do on your own or with friends and family. As well as the above we are also arranging a Remembrance Art Exhibition, which The Society of Marple Artists has kindly agreed to support. The exhibition will be held in Marple Library during the first week of November and admission will be free. We are confident that the art on show will be thought provoking; well worth seeing and not to be missed. Opening times will be published nearer the time. 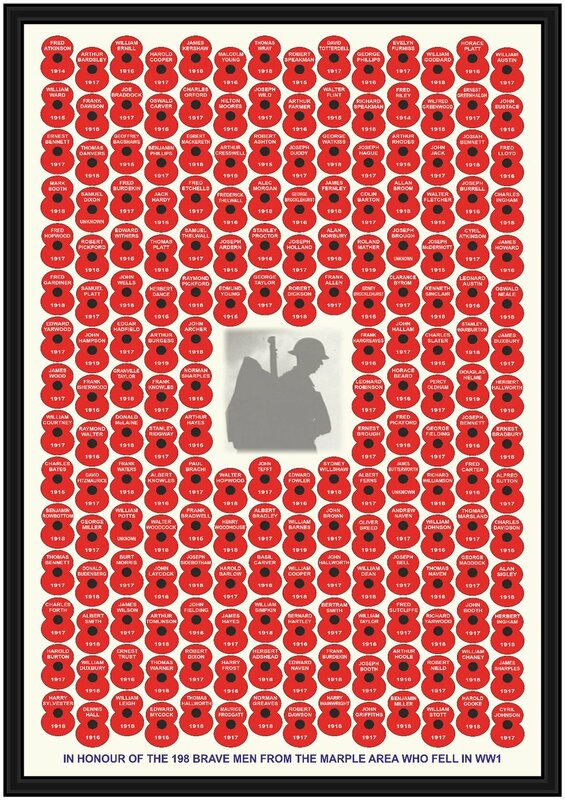 To commemorate the 198 local men lost their lives in WW1 the Marple Poppy Appeal Team have produced an A4 framed print containing 198 poppies showing the names and year when each man fell. They are asking for a minimum donation of only £10. A larger version is also available for minimum donation of £30. If you would like one please get in touch. At Remembrance Time many people want wreaths but often leave it too late to order one and so end up disappointed. If you would like a wreath for your group, organisation, business or for personal use please contact us for details of the various types of wreaths that are available. We expect this year to be very busy as we commemorate the centenary of the end of WW1 and we are therefore looking for additional volunteers to help man our stands at Asda and Marple (Wyevale) Garden Centre. So if you can spare an hour or two in the first week in November and you are interested in joining our volunteer group, then please apply to help. Read more about the successful 2017 Marple Poppy Appeal.